I am always, ALWAYS, hunting for great gift ideas that will keep my son’s brain (and hands) occupied. He’s so smart (way smarter than he thinks he is, but we won’t get into that), that we can’t just buy any old stuffed animal and expect him to be actually occupied (because there is a difference). He needs things that will engage him, keep him thinking and that will give him a sense of accomplishment when he’s built something or done a cool task. So, I seek out STEM (or STEAM) projects and toys all year long, dole them out when we need to, or just hide them throughout the house so I can surprise him on Christmas morning with a ton of new things to get him thinking. 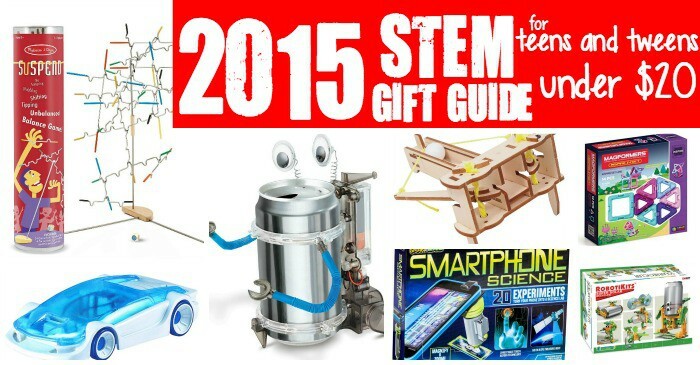 This year, I’ve got a list of 25 STEM activities, games and toys that I’ve been stocking up on all year that I’ve put into a handy 2015 STEM Gift Guide for Tweens and Teens for Under $20. Because, you know, we can be all “science, math, tech, art, and math” but still be thrifty-frugal-money-wise. To see the gift ideas for teens and tweens that I put together, just use the arrows to click through and see all 25 Science, Technology, Engineering and Math Gifts I’m getting my teen this Christmas.